As mentioned last month, The Hum‘s Rachael Pazdan is now booking the Manhattan Inn, and the December schedule for the venue is now here. HIghlights include Tigue (who were also just announced for Ecstatic Music Festival) and Alpenglow on 12/3; Arc Waves, Katie Von Schleicher (who was also just announced for Invisible Familiars’ Ace Hotel residency) and Cantina on 12/7, Psychic Twin and Jen Goma (ASDIG, TPOBPAH, People Get Ready) on 12/10; and Cuddle Magic, Booker Stardrum and Ryan Dugre on 12/14. 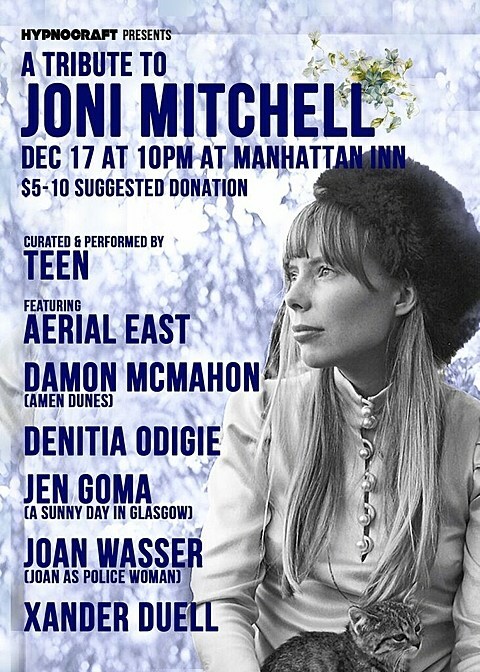 The final show (unless they add more before the year ends) is a Joni Mitchell tribute on December 17, curated by TEEN (who are also performing) with Jen Goma, Damon McMahon (aka Amen Dunes), Xander Duell, Miles Francis, Joan Wasser (Joan As Police Woman), Aerial East, Noah Hecht and Ryan Dugre. It’s a suggested $5-10 donation, space is limited and entry is based on a first come first serve basis.